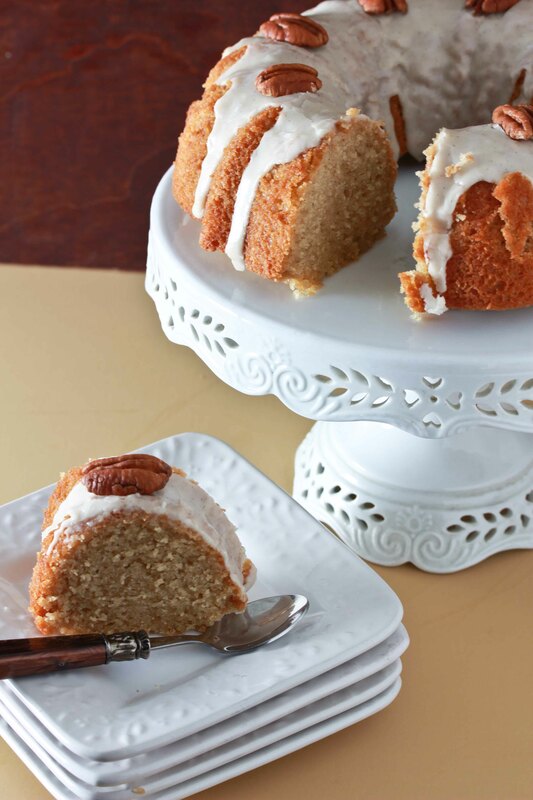 This post is going to be very short, but it’s totally worth it because I have a fabulous new bundt cake recipe to share with you today! My awesome friend BL came to my house for Shabbat recently, and in her honor, I knew I had to come up with a delicious cake to serve. One of her favorite dessert flavors is maple, so my mind naturally went there. 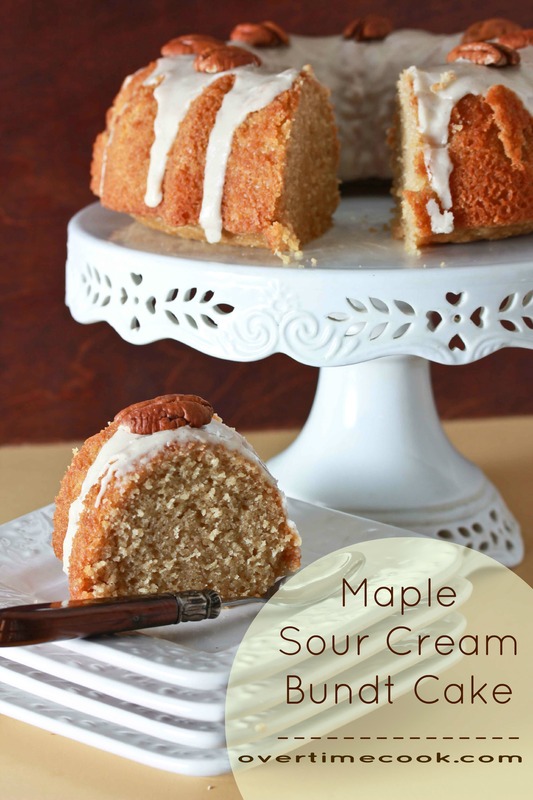 Add in some sour cream (or tofutti sour cream, if you are so inclined) for richness, and you are left with one of the most delicious bundt cakes I’ve come up with in a while! If you are looking for a delicious, simple, and very pretty cake, try this. It’s dense and pound cake-like, but with a wonderfully different flavor. You’ll totally love it! If you are looking for a dairy cake recipe for the upcoming holiday, try this with butter and sour cream. If you want a non dairy option, sub those out with margarine and tofutti sour cream – the cake will still be fabulous. Preheat oven to 325. Spray a bundt pan well with floured baking spray and set aside. In the bowl of an electric mixer, combine the butter/margarine and sugar and beat until smooth. Add the eggs, one at a time, beating well to combine after each addition. Add the vanilla extract and baking powder, and beat to combine. Turn the mixer to low speed, and add about a third of the flour. With the mixer still running, add half of the maple/sour cream mixture, then another third of the flour, the remaining maple mixture, and finish off with the rest of the flour. Beat until combined, but don’t over-mix. Pour the batter into the prepared bundt pan and bake at 325 for about an hour, until a tester inserted into the middle comes out clean. Set aside to cool fully before glazing. Combine all ingredients except pecans in a bowl and stir until combined. Drizzle over cooled cake. If desired, sprinkle toasted pecans over the cake immediately after drizzling. Mmmm I want a piece of this cake…. I am making a recipe from your column in the Ami! That glaze sounds to die for! do you have to use bourbon? You can use extra vanilla instead. What an interesting and delicious cake – fantastic. Oh and it looks great too. yum! miriam ur stuff always looks so amazing and always tastes awesome! the cake looks amazing in the picture, very dense with a nice crumb. i want a piece! omg that bundt looks fantastic! The exterior looks so delightfully crispy but so dense and moist inside. Wish I were eating this for breakfast right now. I never have bourbon in the house, should I use rum? If I just use vanilla extract, how much, and will it make the cake less tasty? Vanilla extract is fine! Rum should work, but I can’t say for sure because I haven’t tried it. This looks perfect for after the fast! I don’t have a milchig bundt pan, can I use a springform or loaf pan? Thanks! Why are you using oil in the bourbon glaze. It helps with the texture. Can you use oil rather than margarine? 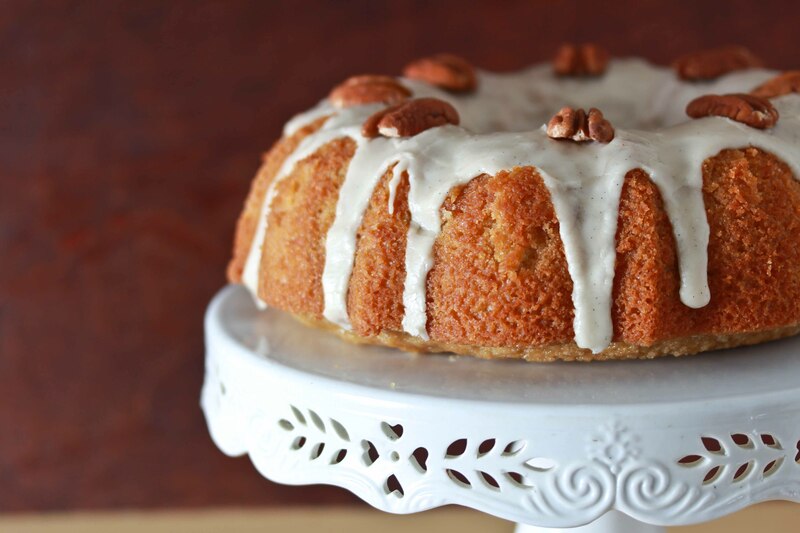 I usually use oil in bundt cakes and its always good.. This cake does have a thicker, pound cake, quality to it, so margarine is better but you can try with oil. It saddens me as a cook to think that by the ingredient “maple syrup” you need to post “do not use pancake syrup”. Pancake syrup is NOT maple syrup. Maple syrup is the sap of the maple tree. Pancake syrup is a manufactured topping for pancakes which SHOULD, but doesn’t even always, contain Maple Syrup as ONE of its ingredients. Why do people even assume they are interchangeable??!! How much extra vanilla if I don’t use bourbon? This glaze is out of this world!! Delicious! I made this in two disposable loaf tins and froze one (before glazing) since our family can’t finish a whole bundt cake at once. I served it with a homemade strawberry/blueberry dessert sauce. It got rave reviews!